That dhan - that soul bride who attaches herself to the husband Lord God Waheguru, randd n kabehoo baisee - she never sits as a randd - as a widow, she is never widowed, that means that her husband Lord never leaves her. She is never left alone she is always in the company of her husband Lord. Naa kadhae hovai sog - she never goes into sog - into sadness. Because Waheguru is with her at all times. Naa kadhae hovai sog - that soul bride doesn't have any sog - doesn't have any suffering, doesn't have any pain. Anadhin ras bhog - day and night she enjoys the ras - the essence of God's name. saa dhan mehal samaanee - that soul bride merges into that mehal - into the mansion of God's presence, into the very form of Waheguru, becomes One with Waheguru. That soul bride who is jaathaa - who has found her beloved Lord, karam bidhaathaa - the Creator of all destiny, the architect who has made all, the one who has created everything. Bolae anmrith baanee - that soul bride continuously sings the anmrith baanee - the immortal words of the Guru. Gunavantheeaa - those soul brides who are full of gun - who are full of virtues, gun saarehi - forever and ever they remember, they meditate upon the virtues of God. Apanae kanth samaalehi - they keep their kanth - their husband Lords Waheguru in their mind at all times, samaalehi means to remember at all times. Naa kadhae lagai vijogo - at any point, at no point are they vijogo - are they separated. Once they've merged with God there is no separation. Praise that Eternal Waheguru, that pir - that husband Lord who can do sabh kish - who is the Creator of all, in whose power is everything. If we say how can we find Waheguru? Sathiguru jee says you can pashaaneeai - Sathigurujee says you can recognize that sacharraa - that true Lord master through the sabadh - through the Guru's Words. 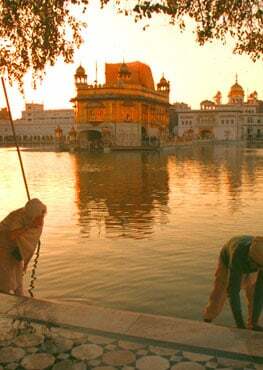 Aapae leae milaaeae - if you meditate on the sabadh then Waheguru jee Himself will merge you in. That soul bride who meditates upon the sabadh is rathee - is imbued with the color of God's love, pria kai rang - God's color of love. Vichahu aap gavaaeae - in this color of love that soul bride vichahu - from within aap gavaaeae - gets rid of all sense of aap, all sense of ego. That soul bride gives up all sense of ego fir kaal n khaaeae - then death cannot khaaeae - death cannot devour you. guramukh eaeko jaathaa - the guramukh - that person who keeps the Guru as the center in their life eaeko jaathaa - has recognized that only one Waheguru is the one who does all, has recognized that Lord God lives within. Kaaman - the soul bride's eish - desires of the soul bride. What desire was that? To meet God. Anthar bhinnee - when that soul bride was colored, bhinee - means to be completely drenched with God's love inside. When that soul bride got drenched with God's love then miliaa jagajevan dhaathaa - then that soul bride was untied with jagajeevan dhaathaa - then she was united with the jagjeevan - the life of the world, dhaathaa - the giver forever and ever. Those who are raathee - who are imbued with the color of the shabad, with the color of the love of shabad, joban maathee - they are intoxicated with true youth. What does this mean? That those people whether they are 90 years old, whether they are 9 years old, 19, 29 - doesn't matter what age they are, they have that youthfulness about them, what youthfulness? Every morning amritvela - someone gets up at 1, somebody is getting up at 2am, 3am, 4am - whatever time they start their amritvela. Sitting, doing ishnaan chanting Waheguru Waheguru Waheguru Waheguru, doing Japjee Sahib, doing Sukhmani Sahib, reading the banis, listening to the Guru's words, walking to the Gurudwara Sahib, sitting in the sangat, always doing seva - having that youthfulness about them. They are intoxicated. In the sangat the 90 year old is doing seva and so is the 9 year old - they are both intoxicated with the same enthusiasm. Pir kai ank samaaeae - in this way they samaaeae - they merge into the very being, ank means the very form of God. If you want to pashaan - if you want to understand, if you want to realize the sacharraa sahib - Waheguru, the true Lord, that can only happen through the shabad. Aapae leae milaaeae - if you look in the shabad then Waheguru jee will merge you with Himself. Those gurmukhs, those saints, those followers of the Guru who have pashaaniaa - who have recognized God within them ho thin poosho santhaa jaaeae - I will go to those saints and I will ask them the path. What do they say? Give up your sense of aap - give up your sense of ego and saevaa karee - then serve Waheguru. Pir sacharra milai sehaj subhaaeae - then you will be united with your sacharra pir - your true Husband Lord Waheguru but in sehaj subhaaeae - if you color yourself in the color of sehaj. Sehaj means to be in the color of complete poise where there is no happiness, no sadness, where there is complete equality, complete balance within and that can only come when you give up your sense of ego. If you kamaaeae - if you practice saach - the truth within your life then you will meet the true Lord. Saach sabadh dhan raathee - in the True Love the soul bride in imbued. That soul bride who is colored in the True Love of God kadhae na raadd - she is never left by God. She is always in His company. She is always a happily married soul bride to God. Anthar sehaj samaadhee - inside, deep within her she is imbued in the samaadhee - meaning that deep level of concentration, that deep level of focus in the stage of sehaj - in the level of complete balance. Doesn't matter where she is walking along she is in that samaadhee - that soul bride, that person who is in that they can be talking but will still be imbued in that love. That Waheguru, that Lord God, that husband Lord, that pir is bharapoorae - is pervading through all, vaekh hadhoorae - look He is with you at all times. Rang maanae sehaj subhaaeae - those people who realize this they maanae - they enjoy the rang - the love of God sehaj subhaaeae - because they are colored in that stage of complete balance and poise. Those who have recognized their kanth - their husband Lord ho thin pooshoo santhaa jaaeae - I will ask them the path. Even those who have been vishunneeaa - who have been separated because of their bad karam, because of their misdeeds in past lives bhee mileh - even they can be united with the true Guru jae sathigur laageh saachae paaeae - even they can be united with Lord God if they are laageh - if they attach themselves to the true feet of the true Guru, of the Eternal Guru - if they follow what the Guru says. The Guru is forever merciful - forever dhaeiaal - forever forgiving, avagun sabad jalaaeae - if you fall at the feet of the Guru the Guru will burn away within you the dirt of all avagun - the dirt of all misdeeds through the sabadh. Aougun sabadh jalaaeae - your aougaun - your sins, your vices are burnt away through the sabadh - dhoojaa bhaao gavaaeae - your love of duality, your love of the material gains, of maya is gavaaeae - is removed. Sachae hee sach raathee - that soul bride is completely raathee - completely imbued in the color of God's love, in the color of the love of that true Lord. Through the sabadh of that sachaa Waheguru, through that God, through the true sabadh of Waheguru which is received from the true Eternal Guru you will receive Eternal sukh - sadhaa sukh - continual peace, peace which is never ending. Houmai gee bharaathee - if you color yourself in the sabadh then your haoumai - your ego gee bharaathee - meaning your doubts, they will all melt away. That pir - that husband Lord is niramaaeil - that husband lord is completely immaculate - the purest of the pure. Sadhaa sulkhadhaathaa - He is forever giving out sukh - peace. Naanak sabadh milaaeae - Sathiguru Amardaasjee Maharajee says you can united with Him through the sabadh - through meditating upon Waheguru Waheguru, through reading the Guru's baanee. Even those who have been separated from pirahu - their husband Lord Waheguru bhee mileh - even they can be united with the Guru, united with Lord God jai sathigur laageh saachae paaeae - if they attach themselves to the feet of that Eternal True Guru.